Jute grows in abundance in the area around Sreepur as it does in most of Bangladesh . The monsoon climate provides the ideal wet and warm conditions for growth. Jute is also known as Hessian and is enjoying a revival in popularity for making bags as the western world seeks a cheap alternative to the plastic bag. The plant has a fibrous bark that can also be used to make handmade paper. 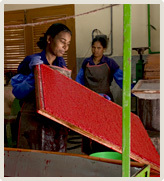 When Sreepur Village opened in 1989 a papermaking unit was included to help preserve this traditional Bengali skill. The jute plants grow to a height of 8-10 feet, they are then cut and left to dry. The bark is stripped and cut by hand before being placed in the beater to make the pulp. The pulp is placed in a water tank in a calculated concentration and sieved by hand onto frames of wire mesh. The frames are left in the sun to dry before the paper is removed and rolled to produce a smooth finish. In recent years the quality of paper being produced reached a very high standard and it was decided that greeting cards could be made to raise funds for the Village. The cards are decorated with a combination of wheat straw and paper. The finished product is totally made from locally sourced natural products.